A highlight of 2017 was the SAP Mentors 10 year anniversary. We celebrated this in style at SAP TechEd Las Vegas. I am so glad that SAP Mentor founder Mark Finnern returned. 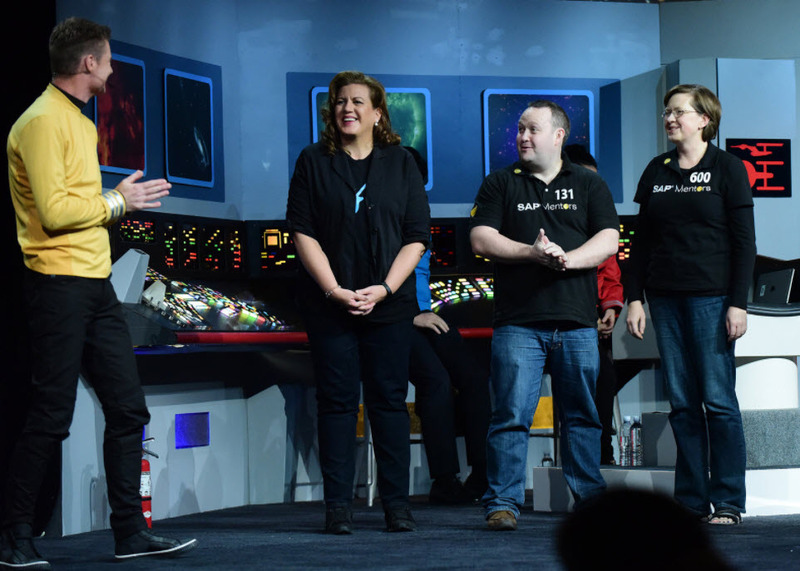 Of course, seeing Jelena Perfiljeva and Chris Kernaghan (pictured with Katarina Fischer ) on the keynote stage with “the” Captain Kirk (aka Bjoern Goerke ) is a certain highlight. Right after SAP TechEd Las Vegas, there was the shooting, and many felt compelled to help. Kudos to Rafael Guimbala for organizing the 24 Hour Mentor Magic Marathon. I attended Julia Dorbic session, DJ Adams session, Steve Guo’s and many more. I presented as well, although I lost half the audience coming after Jose Nunes. All the sessions I attended were amazing – kudos to all who presented. I was very skeptical before this conference and the good news it was a fantastic event. Not only did I think so, but others approached me at SAP TechEd Las Vegas saying the same thing. What stood out to me was Jessica Buchanan’s moving keynote and Jorgen Rasmussen’s keynote (see more about Jorgen here). “It’s a community, not a conference” – this is very true. I hope you’ll consider joining us in Huntington Beach, California next month. We had amazing numbers too on the ASUG side, particularly for abapGit: Modernizing ABAP Development with Graham Robinson – so high, he kindly agreed to repeat it as an ASUG webcast. ASUG Maryland-Virginia Joint Chapter Meeting, Washington, D.C. I was very reluctant to hold an ASUG meeting in Washington D.C. For one, parking is not free – it is expensive. The last time (as I understand it) the ASUG Virginia Chapter paid for attendee parking the cost over $3K. Being a trained accountant, frugality is my nature. Fortunately Ina Felsheim persisted, along with a few ASUG Community Coordinators, and thanks to Richard Gillespie of the Maryland Chapter the meeting was a success, with 109 in attendance. I was glad to be so very wrong about this event. See the recap here. Special thanks to SAP’s Marlyn Zelkowitz for her ongoing, non-stop support of the ASUG Virginia Chapter; the SAP Public Sector content she provides is outstanding. Join the ASUG Virginia Chapter in April – see the 2017 survey results. Usually these calls are moderated by Chris Kernaghan and they are all fantastic but the one I remember the most was moderated by Greg Myers – SAP Veteran to Work Program. SAP’s Diane Fanelli is the SAP Executive Champion for the program and she is very passionate about it. – be inclusive. Be pro-active. Be amazing if possible! 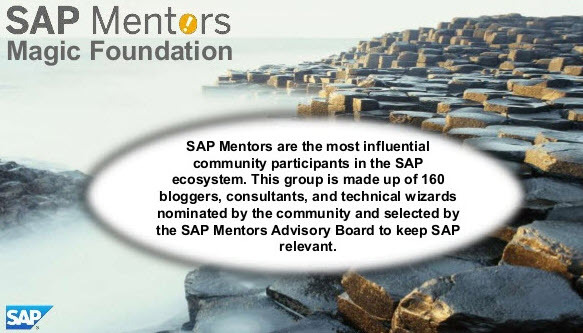 I tried periodically posting SAP Mentor Magic Moments but I confess, I didn’t always keep up. It was great seeing so many Mentors win the SAP Community and SAP Community appreciation awards. Ntombi was a hiking guide too. If you asked me a year ago whether I would go to South Africa, I would have said no! I am grateful to my teen niece who told me “YOLO” – you only live once – that pushed me to go. But now, I am so glad I went. Everyone was amazing, the food was amazing, and the conference was fantastic. I am so glad I got to meet Former Member in person and so many others. I miss the coffee and rusks already. What will 2018 bring? Did I miss anything in 2017? Very nice summary. I love to celebrate successes! Great job to all the mentors out there – for both the ones that are in the mentor program and the ones that are not. Great summary, Tammy! Thanks for highlighting the Community Calls! I’m hoping to see a new schedule for 2018 posted soon. Looking back at the list, I think “Creating the Perfect SAP Incident” session was very helpful. And I really enjoyed Rohit Bhargava’s call “How to (Actually) Predict the Future”. His 2018 book just came out in December and is available on Amazon. I hope we can continue the tradition of reaching beyond the SAP ecosphere for great speakers at the community calls and conferences. Congrats Tammy! Really nice blog! Thank you for mention me and the marathon! I’ve been away on a several week leave, and what a joy to come back and see this great post from you — plus to be called out by *you* AND have you remember my birthday! Thanks for being a big part of why SAP means so much to me and so many! onward 2018! hope to see you very soon this year.